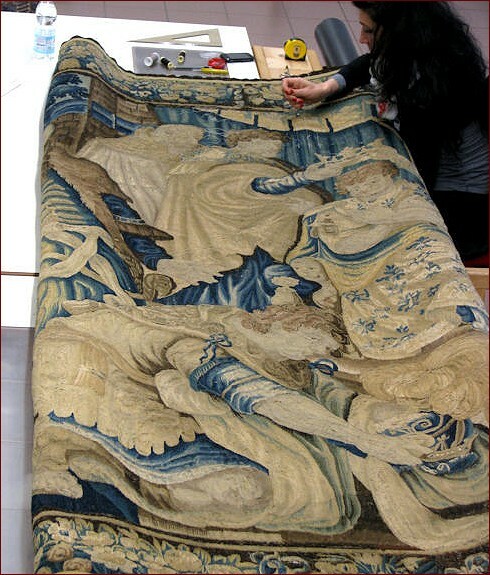 Ancient tapestries require considerable expertise and experience in the choice of techniques and materials used for their washing and their restoration. 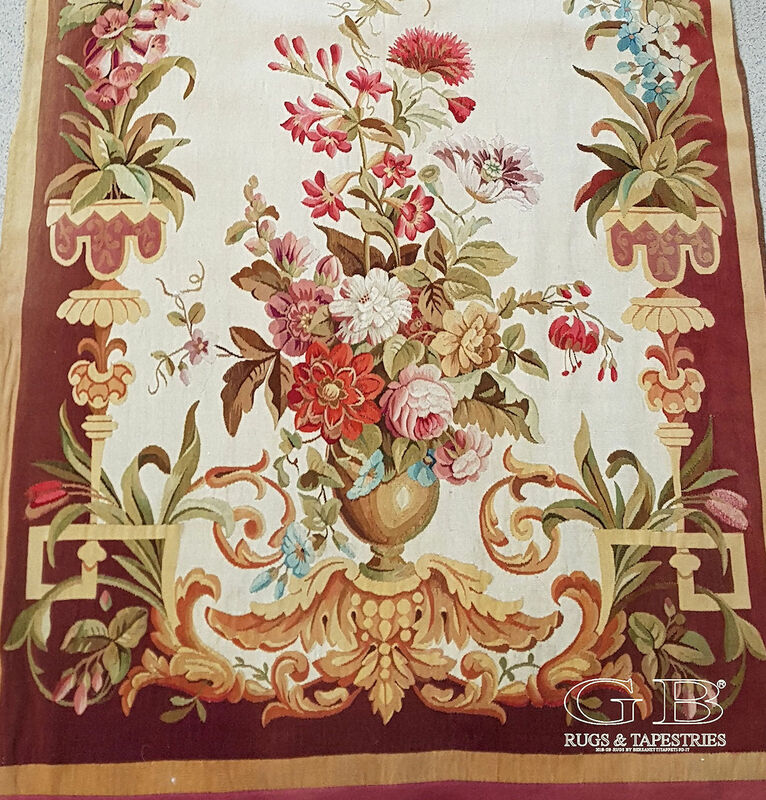 The tapestry, especially if old, should be treated with greater consideration than the carpet and, in order to proceed to an optimal wash, a rather long control and preparation procedure must be followed. Of course it is important to communicate to the customer a detailed estimate of time and cost. 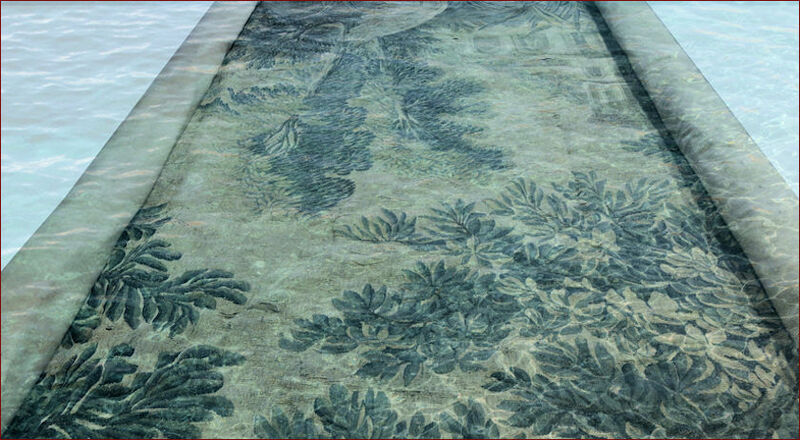 Usually an antique tapestry looks very dirty; the entire surface is affected by a substantial layer of dust that, over the years, has caused phenomena of micro abrasion of the fibers, and has given rise to a series of “ripples” and small deformations, visible in raking light. The weft’s wool and silk fibres are dehydrated with a pronounced tendency to turn to dust. First, we proceed to detach the lining. A sampling is performed on the stability to washing of the various yarn’s colours in order to classify them. From the sampling’s result we can decide what precautions to take when washing it. A low power aspiration is then applied to the tapestry with compressed air at low pressure. If the tapestry is still in good condition we can get on to wash the original liner. 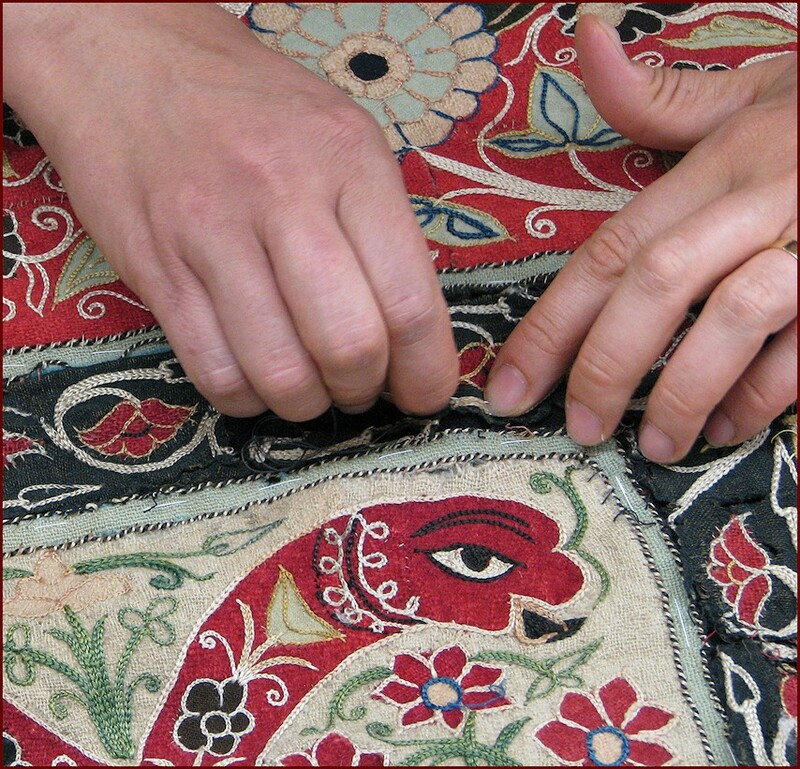 The detachments (seams that connect the different coloured parts of the designs) are checked and, if necessary, are reinforced as a precaution. 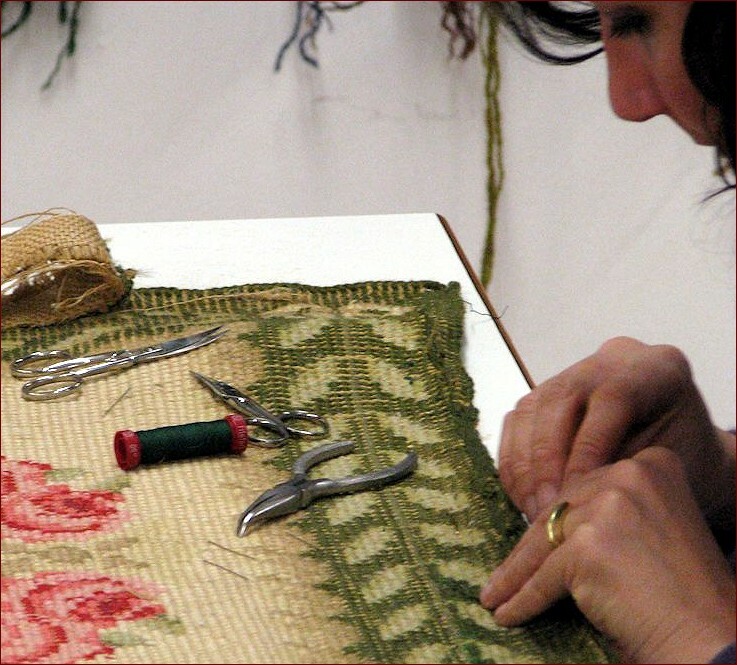 Safety nets are applied on the tapestry’s right and reverse sides to avoid damage during cleaning to any parts of the plots and silk routes. At this point, the tapestry is ready to wash which is done in demineralized water with natural surfactant (saponin), which will be spread by air jets in the tub and regularly watered successive (continued and very soft) that will produce a delicate movement of the water. To give a better idea: it is a kind of very gentle jacuzzi coupled to an action of padding on both sides. There is then a rain-like rinse, always with decalcified water, until the total elimination of saponin. For drying the tapestry is held horizontally in suspension in a dehumidified environment, with forced circulation of warm air. We use, of course, several other measures to optimize the result, details that I cannot describe for business reasons, because unfortunately there are those who not only limit themselves to copy the words I write, and that are part of our forty years of experience. I conclude by saying that our clients enjoy entrusting us with both their recent and antique artifacts. 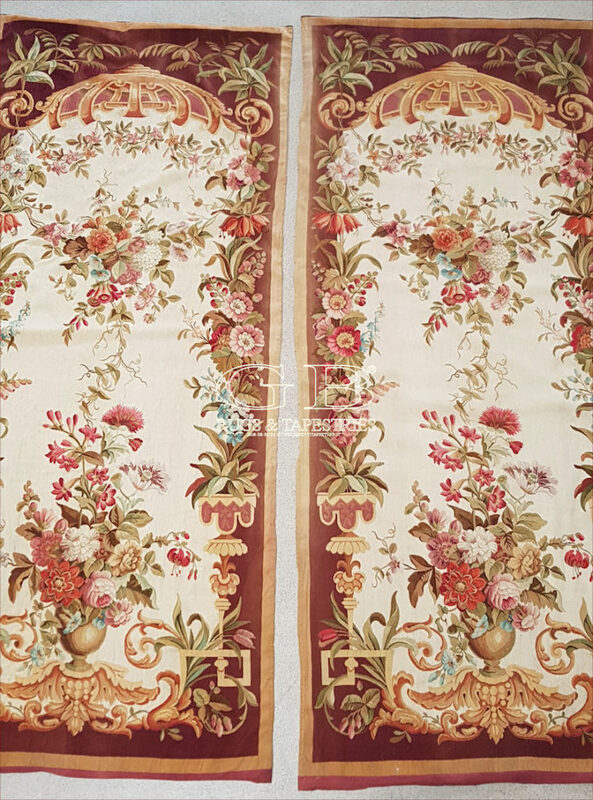 Specify name, address (important), telephone and all possible information regarding carpets / tapestries: size, type. In the form you can also attach an image of your tapestry. For any country no problem: find all the information on the page How to send us carpets / tapestries to be washed. 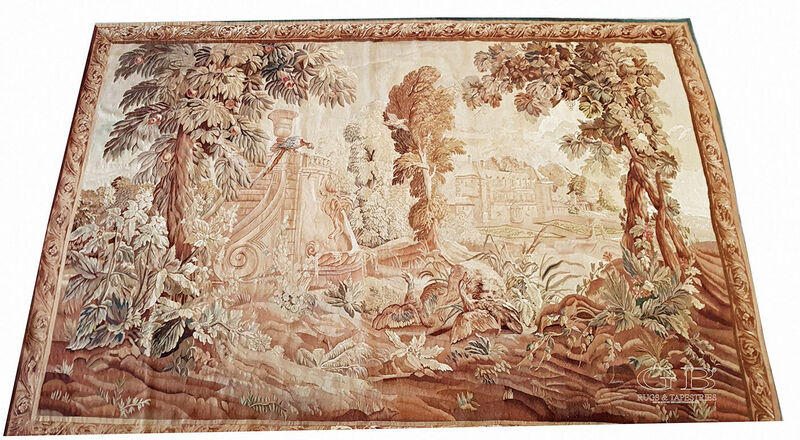 Wash Aubusson tapestries – Ancient Aubusson tapestry Washed after hundreds of years. We obviously use many other devices to optimize the result in the washing of antique tapestries, details that we can not publish..
“Tricks” acquired during the course of our forty years of activity, from the moment. Unfortunately, there are always those who only copy, without guaranteeing the same result. For this reason we do not put videos on the washing of tapestries. We are at your disposal. Contact us or come to visit directly into place. Viale Navigazione Interna 15 · Z.I.